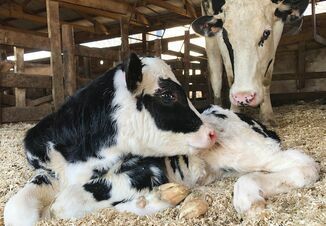 With milk prices slumping, making it a priority to trim feed costs in the heifer-rearing program will be a worthwhile undertaking for many dairy farmers, says Matt Akins, University of Wisconsin dairy specialist. 1. Determine the right number of heifers for your herd. "It's a balancing act," Akins says. "You want to have enough heifers to replace cull cows. But having too many will drive up feed costs unnecessarily." Herd size, cow culling rates, first calving dates for heifers, heifer culling rates, facilities and plans for expansion will all be a part of your calculations. The online "Heifer Replacement Tool," developed by University of Wisconsin dairy scientist Victor Cabrera, lets you plug in specific variables and gives ballpark numbers for working through the planning process. It's available at www.dairymgt.info/tools/ heifer_replacement/index.php. 2. Reduce days on feed. An average age at first calving greater than 22 to 24 months means feeding heifers longer than necessary, translating into higher feed costs. To avoid that, aim to start breeding heifers at 13 months and have them confirmed pregnant by 15 months. Work with your nutritionist to ensure an adequate pre-breeding growth rate of about 1.8 lb. per day, then target to breed when animals are at 55% of mature body weight (around 825 lb. to 900 lb. for Holsteins). Step up feed bunk management. Spending just a few minutes a day to check for refusals in the feed bunk can lead to significant savings in feed usage over time. Akins suggests setting up a simple bunk scoring system that assigns a value of zero through three based on how much feed is left in the bunk from the previous day's feeding. In this kind of system, a slick, cleaned out bunk would score a zero and indicate more feed should be included in the follow-up feeding. A bunk with just a few scattered refusals would earn a score of one, and no changes in daily feed deliveries would be necessary. Bunks with significant amounts of leftover material would score two or three making it necessary to back off on delivery amounts. 4. Feed higher-fiber forages. Keeping the rumen full by replacing corn silage/haylage in rations with higher fiber ingredients (warm season grasses, stover and straw) will lead to reduced intakes and lower costs. "A side benefit is that you won't see as much overconditioning in pregnant heifers," Akins says. 5. Consider limit-feeding. The basic idea with limit-feeding is to cut back on total feed intake (by 10% to 20%) while still delivering required energy and protein amounts. In most cases, that will mean scaling back on forages and bumping up amounts of low-cost concentrates (think byproducts such as distillers grain or corn gluten feed). "You're still putting same amount of nutrients into the heifers, just in smaller packages," Akins says. 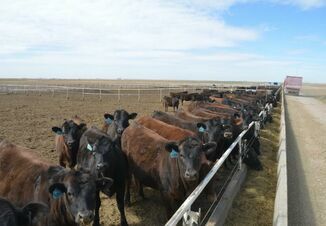 Making the strategy pay off will require formulating least-cost rations, having adequate bunk space available so less aggressive animals aren't crowded out during feeding, pushing feed up more often (especially within the first hour or two of feeding) and weighing animals more often to stay on track with meeting performance goals. 6. Incorporate grazing into your feeding program. In most cases, you'll need to do some supplemental feeding (1 lb. to 3 lb. per day depending on the pasture) in order to meet performance goals. But you'll want to consider whether the time and money it takes to develop pastures is really worth your while, Akins says.